Scenarios are well recognised as an important strategy towards understanding the interface between the environment and the system as well as a means of eliciting and specifying software behaviour. We adopt a broader view of scenarios. For us, a scenario is an evolving description of situations in the environment. 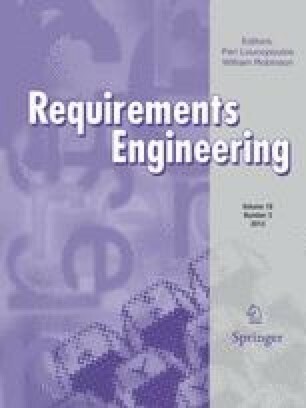 Our proposal is framed by Leite’s work on a client-oriented requirements baseline, which aims to model the external requirements of a software system and its evolution. Scenarios start by describing the environment situations, according to the main actions performed outside the software system. Scenarios also help to clarify the interrelation between functional and non-functional requirements. We have validated our strategy and the related representations based on case studies.